Ask Trish - Show me your Make-up Bag! Show Me Your Makeup Bag! 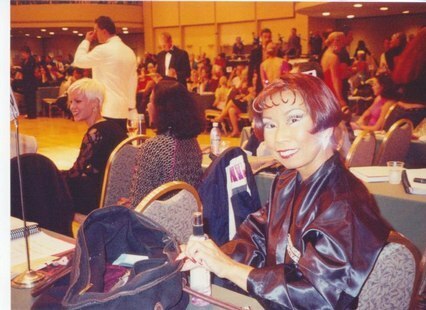 A while ago, you wrote a column called "What's in your Dance Bag? ", or something like that…anyway, my partner and I now do the dance bag thing, but there never seems to be enough room in it for my own makeup bag! What's the deal? Do I have to carry around my own makeup case? Or should I just carry the absolute minimum amount of makeup, and try to stash it in the dark corners of The Dance Bag? …Does anybody else have this problem? Your letter was the inspiration for this month's column, "Show Me Your Makeup Bag!" I, myself, carry around my own makeup bag (a very cool one in leopard print that I bought at Saks, thank you) , in addition to the dance bag I share with my partner. I feel there are some things, like lipstick and other female-inclined products, that I just don't need to share! 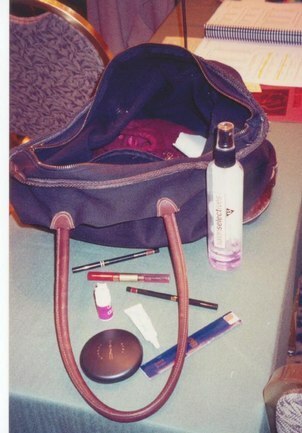 So to help out, I've included my own makeup bag and its contents in this month's topic. Let's take a look at Makeup Bag Number One! Allison Small, Atlanta, Georgia: "I carry, amongst other things: extra hair flowers, an inhaler (I have asthma sometimes,) deodorant—don't want to be stinky!—and Christian Dior blusher. Also, face powder, and my favorite lip gloss, "Work That Skirt" lip goo in Dancing Darling, by Benefit cosmetics." "I have Salon Selectives "Sit Still" hair spray, MAC face powder, nail files, nail glue, eyelash glue, Revlon Colorstay Lip Shine in Red, Revlon Colorstay Lip Liner in Red, and some other things in here that I don't care to mention but my partner, Tommy, seems to get a kick outta telling you…thanks, Tommy!" …Let's see….Madina Milano eye shadow palette, Lip Ink lip color (Red and Hot Pink are my two favorites,) Sally Beauty peppermints, an eyeliner sharpener, some Dentyne Artic Ice gum, extra eyelashes, and matches from the Royal Cafe in New Orleans. 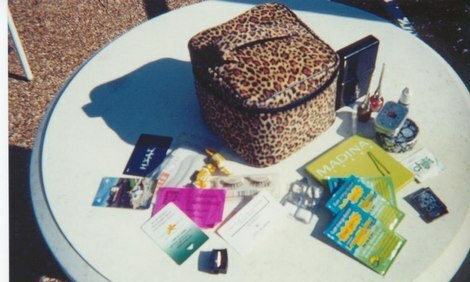 Also, enough Emergen-C vitamin powder drink packets for me and an army, Sally Beauty glitter eyeliner in purple and gold, nail glue, Stila eyeshadow in Bohemian, some crusty Ricola cough drops, and an even crustier handy-wipe from Chili's Restaurant….not to mention enough random hotel room keys to start my own Motel 6. And….some stray hairpins, stray rhinestones from old costumes, and a small pack of tissues that say "princess" on them. …No wonder my partner makes me carry around my own makeup bag…or should I say, makeup trailer…. Look For Trish at the Ohio Star Ball, November 20-24, in Columbus, Ohio! Ask Trish to do your makeup for the competition, in the privacy of your own hotel room. Call 941-685-8762, or email TrishDatesOBrien@aol.com, to schedule your appointment.